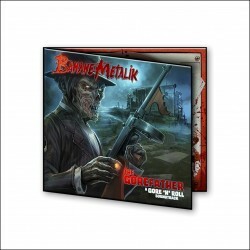 THE FIRST ARTBOOK of BANANE METALIK with a CD made of 2 unreleased tracks ! Hardcover with a very nice selective varnish ! 180 color pages to devour !! 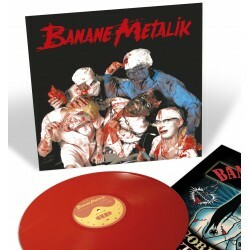 THE FIRST ARTBOOK of BANANE METALIK with a VINYL and CD made of 2 unreleased tracks ! Hardcover with a very nice selective varnish ! 180 color pages to devour !! "Nice to meat you", the third album of Banane Metalik released in 2008. In Vinyl version. Hellcome my guest !!! Digipack CD "Sanglantes Confessions", limited edition (150 copies). Entirely remastered and for the first time ever on digipack, discover one of the first musical fragments of Banane Metalik's history, with 2 unreleased bonus tracks ! Out in early october 2016. 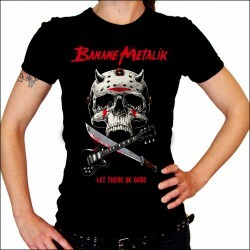 "Nice to meat you" CD Digipack The third album of Banane MetalikReleased in 2008. Hellcome my guest !!! 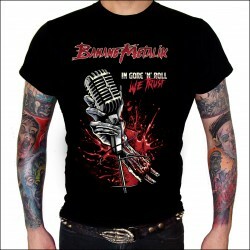 The new official T-shirt "IN GORE'N ROLL WE TRUST", printed for the release of our first art book (released in early January 2019). Women Tshirt "LET THERE BE GORE"
The official T-shirt of the LET THERE BE GOE TOUR ! 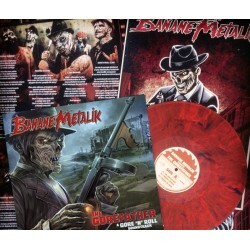 Pre-order the vinyl "Sanglantes Confessions", 12" blood splatter LP, limited edition (200 copies). Entirely remastered and for the first time ever on vinyl, discover one of the first musical fragments of Banane Metalik's history, with 2 unreleased bonus tracks ! Out in early october 2016.